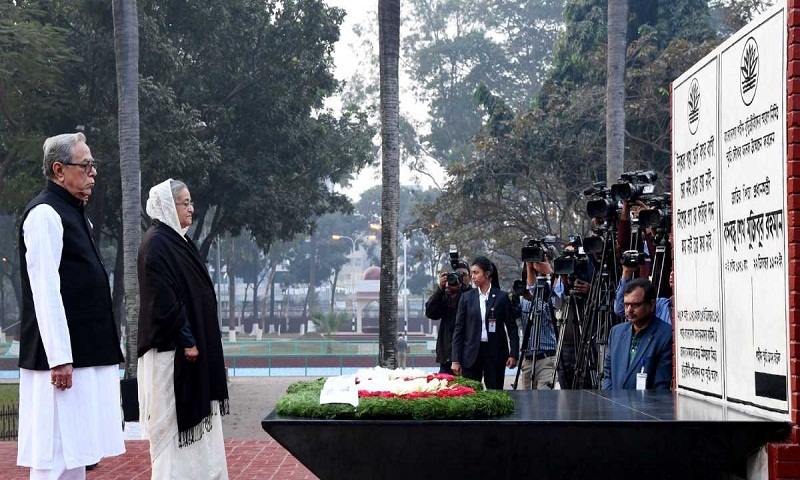 President Abdul Hamid and Prime Minister Sheikh Hasina placed wreath at the Martyred Intellectuals Memorial at Mirpur in the capital today. nation, a day before the final victory during the 1971 Liberation War. the bugle played the last post. The premier paid the homage by placing a wreath at the Martyred Intellectuals Memorial at Mirpur in the city this morning. After placing the wreath, she stood in solemn silence for some time as a mark of profound respect to the memories of the illustrious sons of the soil. A smartly turned out contingent of Bangladesh Armed Forces gave a state salute while the bugle played the last post at that time. The nation is observing the Martyred Intellectuals Day to commemorate those intellectuals who were killed systematically by the Pakistan occupation forces and their local collaborators at the fag-end of the country’s Liberation War in 1971. Sensing an imminent defeat, the Pakistani forces and local collaborators like Al-Badr, Al-Shams and Razakar forces committed the cold-blooded mass murders aiming to annihilate the country's intelligentsia and cripple the emerging Bangladesh intellectually. Among the martyred intellectuals are Prof Munier Chowdhury, Dr Alim Chowdhury, Prof Muniruzzaman, Dr Fazle Rabbi, Sirajuddin Hossain, Shahidullah Kaiser, Prof GC Dev, JC Guha Thakurta, Prof Santosh Bhattacharya, Mofazzal Haider Chowdhury, journalists Khandaker Abu Taleb, Nizamuddin Ahmed, SA Mannan (Ladu Bhai), ANM Golam Mustafa, Syed Nazmul Haq and Selina Parvin.